In 1867, less than three years after the Civil War left the city in ruins, Hungarian Jewish immigrant Morris Rich opened a small dry goods store on what is now Peachtree Street in downtown Atlanta. Over time, his brothers Emanuel and Daniel joined the business; within a century, it became a retailing dynasty. Join historian Jeff Clemmons as he traces Rich's 137-year history. For the first time, learn the true stories behind Penelope Penn, Fashionata, The Great Tree, the Pink Pig, Rich's famous coconut cake and much more, including how events at the downtown Atlanta store helped John F. Kennedy become America's thirty-fifth president. 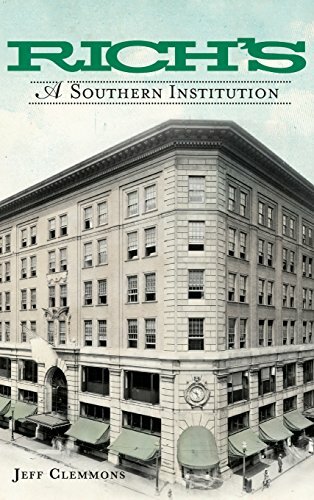 With an eye for accuracy and exacting detail, Clemmons recounts the complete history of this treasured southern institution in this handsomely packaged hardcover edition of the beloved original paperback. Jeff Clemmons has lived in Atlanta for more than a quarter century. He created and leads walking tours of the Midtown and SoNo districts for the Atlanta Preservation Center, and he serves on the board of the APC's auxiliary group CIRCA, which offers its members private tours of some of metropolitan Atlanta's most interesting historical structures.